It is difficult in our society for a person of legal driving age to avoid the systematic indoctrination that car culture forces upon us. From car advertisements on television & billboards, to celebrities showing off their fancy wheels, to “auto” sections inside newspapers, to social peers who define “success” by the type of car you drive. But car culture doesn’t just inflict itself on people who are of legal driving age. Car culture indoctrination starts at a very young age. This evening my 2-year-old daughter asked if she could watch a particular children’s program on YouTube. I put the show on for her while I finished up some work. In the “related videos” section, she saw a video with a car in it, and asked me to play it. I curiously obliged. 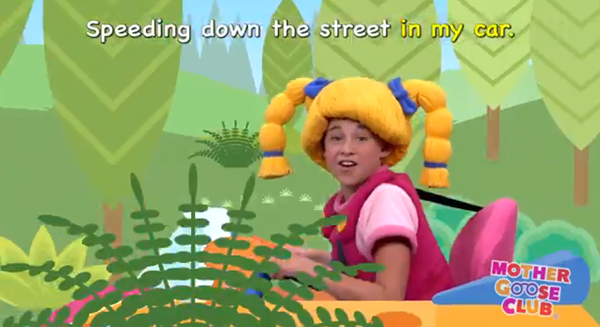 The video, from Mother Goose Nursery Rhymes – features a girl around 9 years old – who is singing a rather annoying song that celebrates car culture and car dependency. The “Driving my car” video has garnered more than 13 million views on YouTube since it was uploaded on April 19th, 2013. But first, we have to buckle our safety belt. This video illustrates how deeply ingrained our obsession with cars really is. Many of us grew up with this indoctrination from a very young age. This is what our young children are exposed to. I prefer the message about car culture from The Wind in The Willows, I love the image of Mr Toad flanked by two police officers after he has gone mad in the car! Cars are deeply ingrained in children’s toys and many books as well. I would love to see bicycles and bicyclists in children’s books and bicycle-culture toys. I echo Kathy’s statement. I’ve been wondering for a while if the Cars Disney Franchise was funded by the automobile industry, it is so overt in personifying cars and trucks that it’s message is dangerous. Hence I’ve taken to review books for kids that encourage the bicycle. Are there any movies / tv shows for kids out there that are bicycle friendly? Below are two of my favourites kids books.